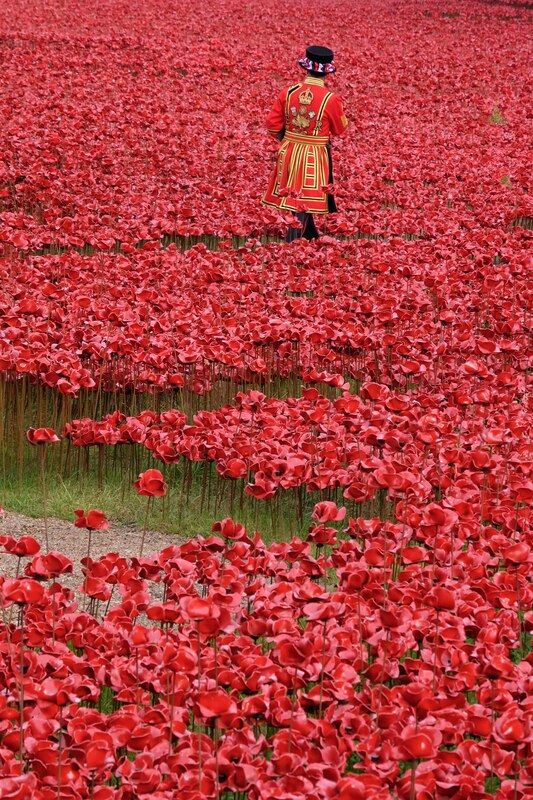 There has been a bit of a poppy frenzy going on in London, by virtue of the “sea of blood” filling the moat at the Tower of London to mark the centenary of the start of the First World War. 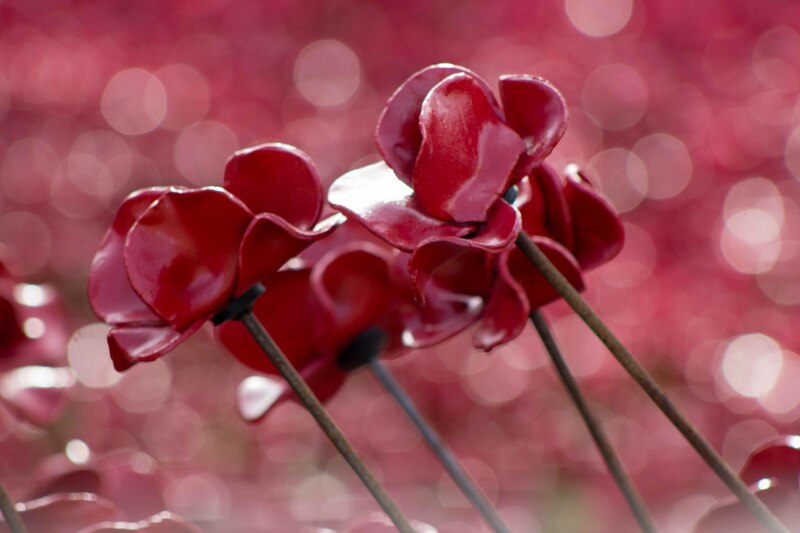 The ‘blood’ was made up of thousands of ceramic poppies – one for each Commonwealth soldier who lost his life during that great war. 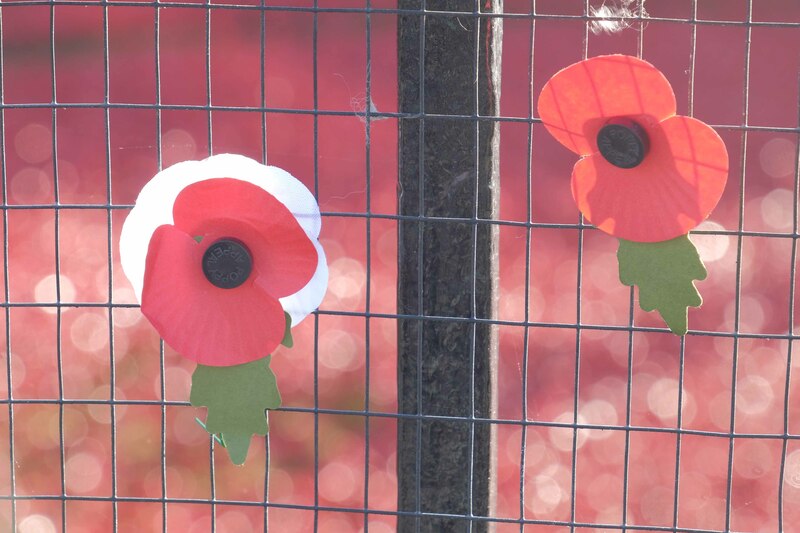 The installation process began in the summer and slowly grew each day to mark the soldiers who fell until the last poppy was planted on Armistice Day by a young army cadet. 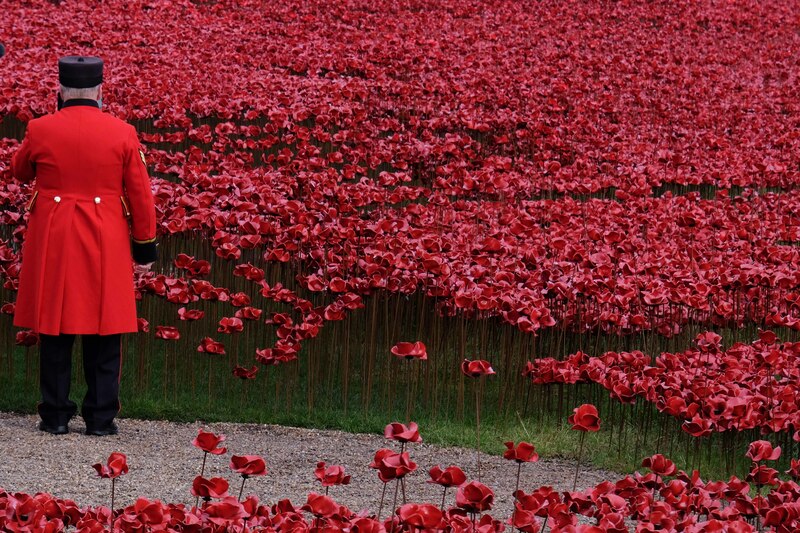 With the addition of each flower it seemingly captured more and more of the public’s hearts until it became London’s biggest tourist attraction. 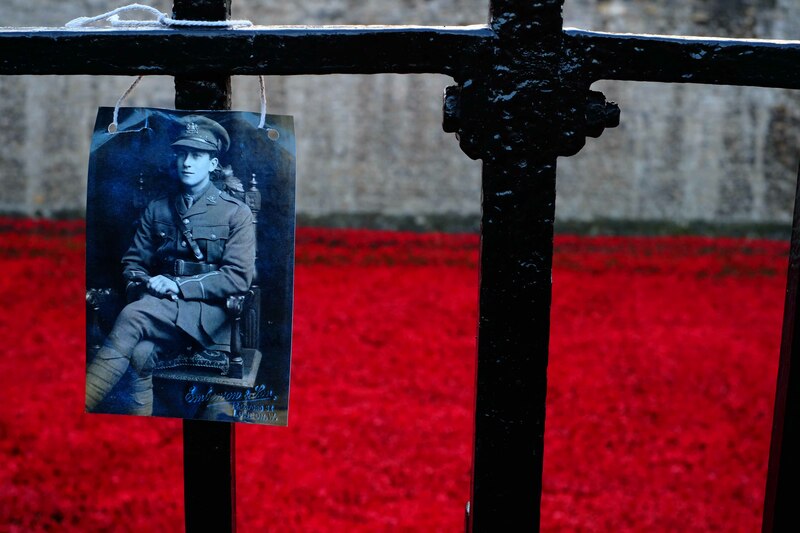 People flocked to do ‘selfies’ of themselves with the poppies; they marvelled on how beautiful they looked on-mass and many rushed to buy them, post-installation, at £25 a pop. No doubt they will make a good investment and some wily people, fully aware of this, were already trying to cash in by selling them on Facebook before the display had even been dismantled. I had mixed feelings about it all. 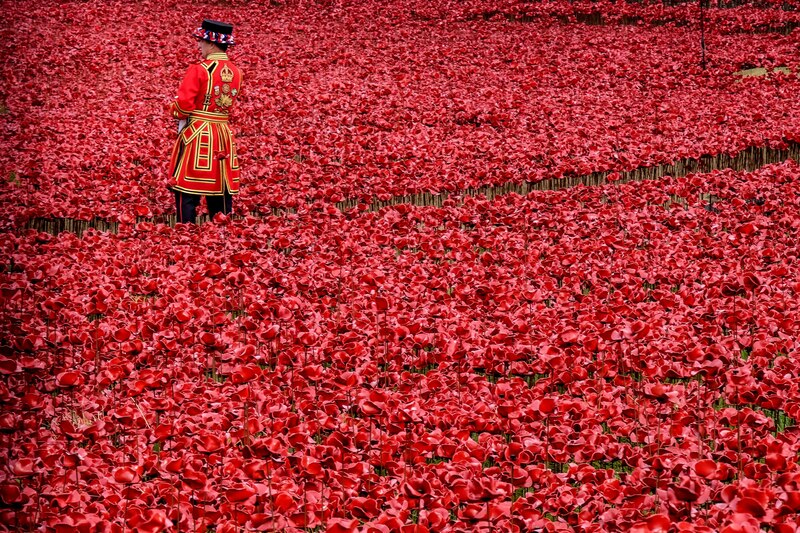 I wondered if the soldiers would have approved of their barbaric, needless deaths being remembered as something to ooh and aah about and a backdrop for selfies. 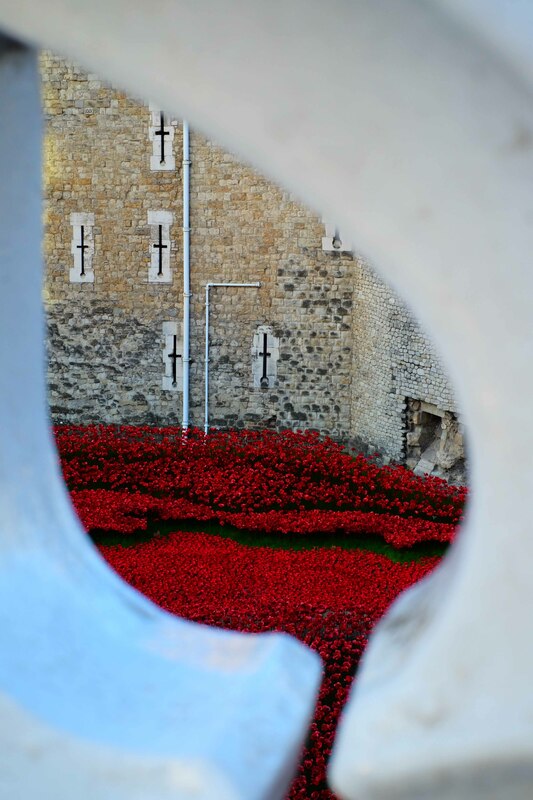 And more worryingly, I wondered if the act of creating a thing of such intense beauty was glorifying and romanticising war or, at the very least, accepting it as an inevitability. By turning those tragic deaths into a glorious work of art it was almost as if their deaths had formed some kind of artist’s palette; albeit a selective one. 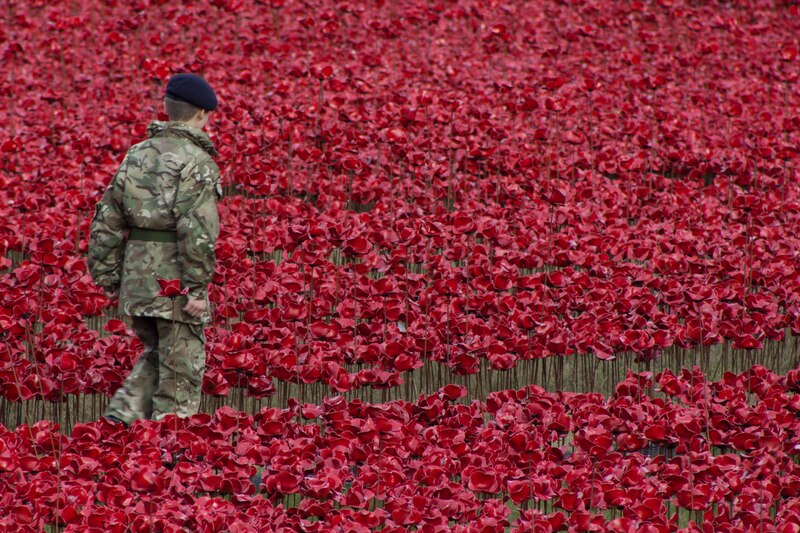 Why should we just sigh and shed a tear over those poor ‘Tommies’ while forgetting that war continues and that hundreds and thousands more lives have been lost then, right up to the present day with the conflicts in Iraq and Afghanistan. 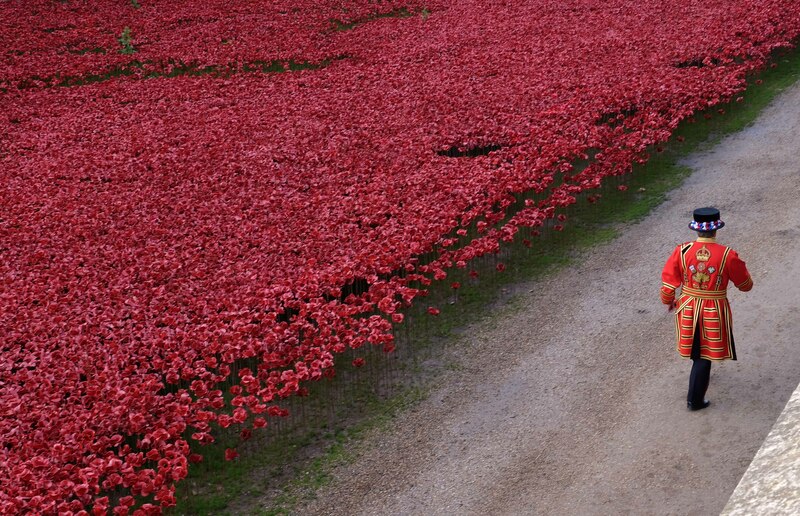 The Armistice Day ceremony also unsettled my mind. 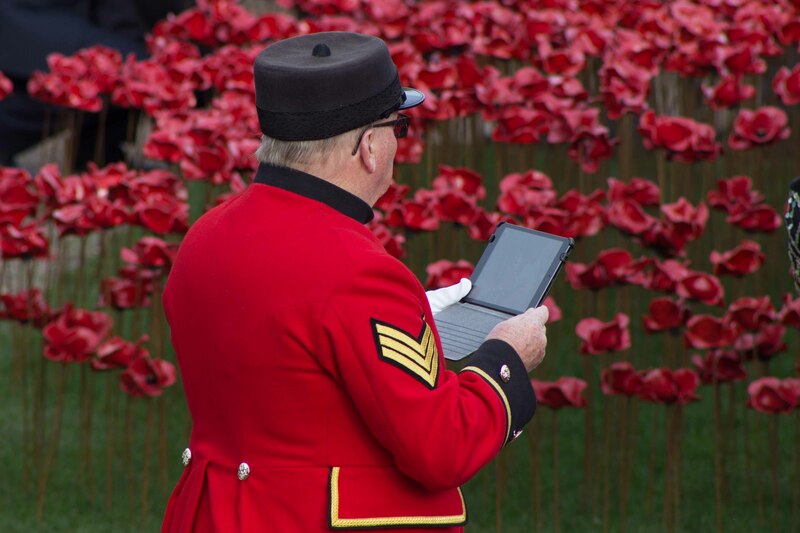 By inviting both Chelsea war veterans in their splendid red jackets and a young army cadet to the ceremony is it not suggesting that war is an inevitability for every generation; and by placing them against that beautiful backdrop where they are made to look so stunning in their uniforms are we not glorifying war just as much now as our forefathers did a century ago when young men were sent to their slaughter with such glorious fanfare? I am glad of my camera sometimes because the mere act of trying to take photos stops my brain from chattering too much with their nagging doubts. 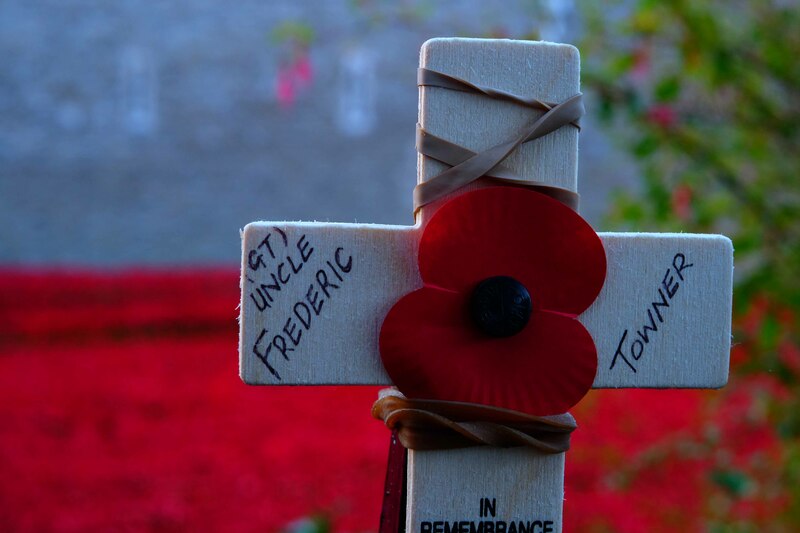 Though I’m aware now that by posting my photographs I am helping to perpetuate that notion of a “good and glorious” war. It makes me wonder about the conscience of photographers, as artists, and where we draw the line. I remember an interview with a conflict photographer, Robert King I think, in which he was asked how he could photograph the atrocities that he has seen in conflict zones such as citizens with freshly amputated limbs. He replied that your mind becomes that of an artist and you try to capture the pools of blood and the decimated body in the most aesthetic way possible. It isn’t that you don’t care, but just like a doctor doesn’t spend time wondering about the life of his patient while you try to save that life, you concentrate on the job on hand and think about it later. In a remote sense that is what I am doing too. I photographed those “pools of blood” in the most beautiful way according to my capability, then shared the photos. 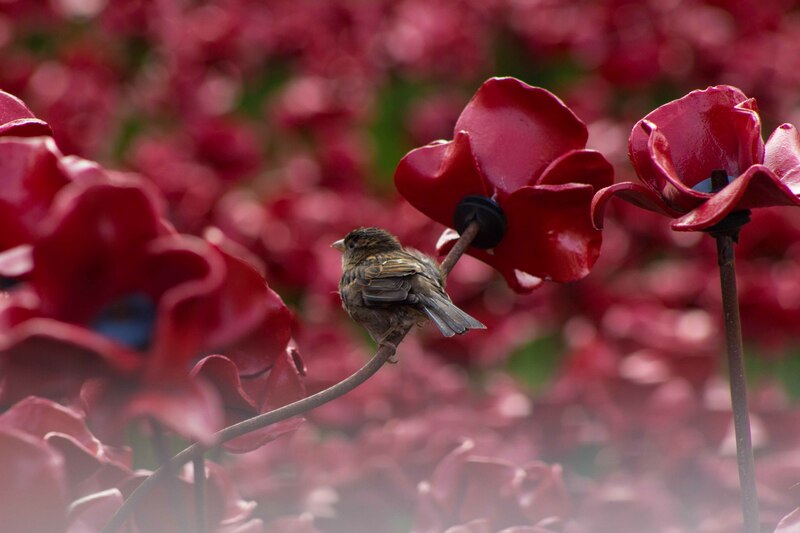 My conscience is slightly troubled by the fact that I am helping to perpetrate war as a thing of beauty by doing so, but at the same time I am recognising another artist’s stunning creation and wanting to share it. Maybe I would feel happier if the actress Shelia Hancock’s suggestion of bringing a tank onto the moat to crush the lot of them had been taken up. 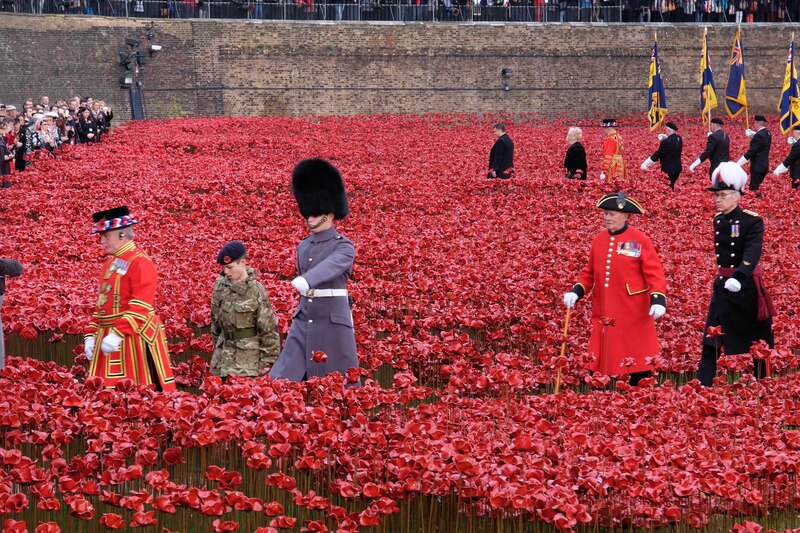 That would have been a more fitting finale, rather than letting people own a poppy as a piece of artwork or, dare I say it, an art investment. I would have been there to photograph that for sure. One thing that comforts me while I pontificate over all this is a wonderful act of nature that I was fortunate to observe. 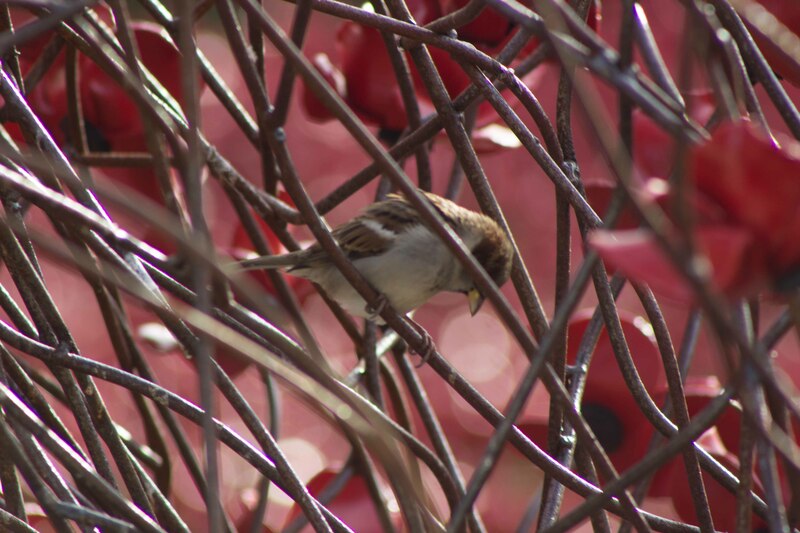 The local birds around the Tower of London had accepted and adapted to the presence of these artificial flowers by quite happily perching on them. 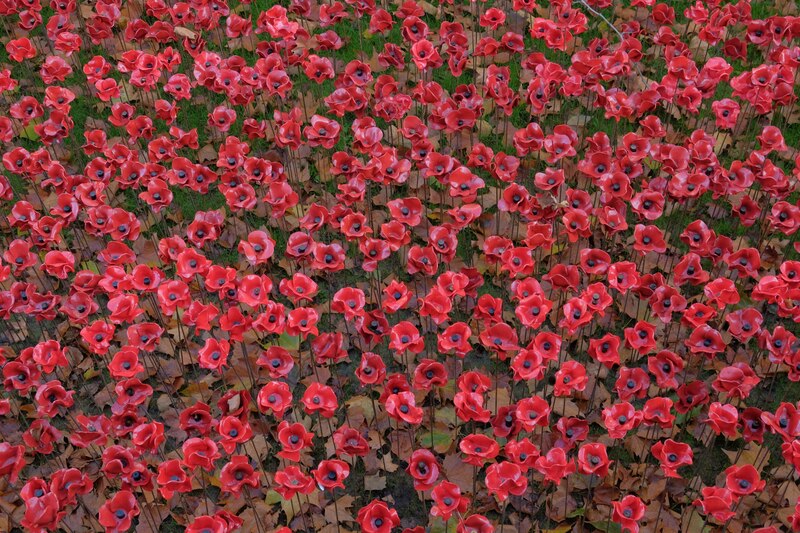 I found this very comforting when I thought of what each poppy represented. 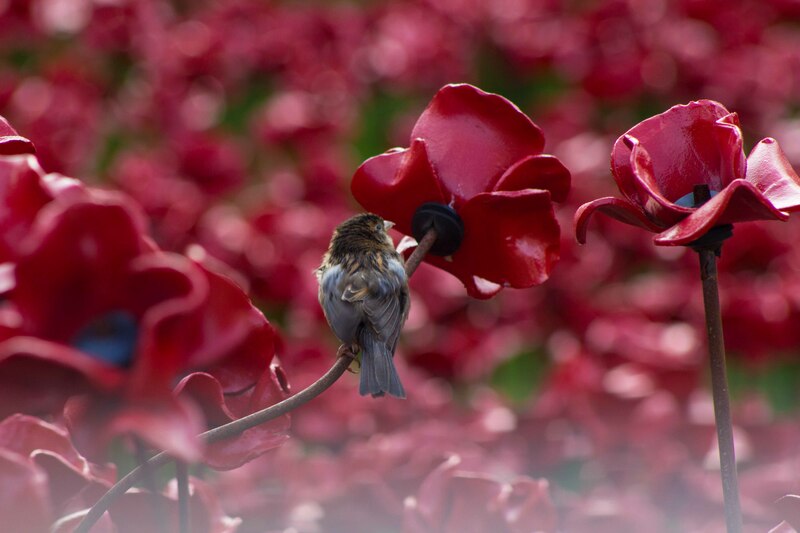 The birds weren’t using the poppies for PR purposes or political gains – they just enjoyed being amongst them. I can’t help but think that this, probably unexpected, sideshow of the whole installation, was the truest and most moving. 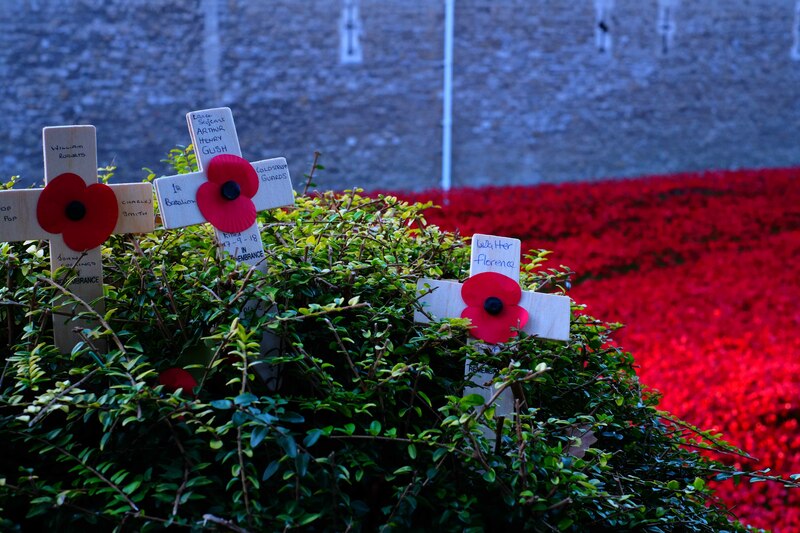 It brings to mind a poem by Thomas Hardy written during that ‘Great War’, entitled ‘In Time of the Breaking of Nations’. Thoughtful piece. Beautiful pictures. Horrific reason. Lessons learned??? Beautifully captured. I too share with you the contributions – particularly the commercialization and the trendiness. stunning photos Eleanor and provocative script too. thanks for giving us a feeling of the place. I also have conflicting feelings about the installation. It is beautiful, but I am not sure if it should be beautiful. I even wonder how many people walked away from the installation without knowing what it was representing.